Goodbye 15th Avenue Coffee and Tea. Welcome home Starbucks Coffee. 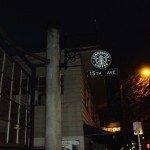 The coffeehouse formerly known as 15th Avenue Coffee and Tea, and which was the first of the two “street level” experimental stores operated by Starbucks, will now officially become a logoed Starbucks. 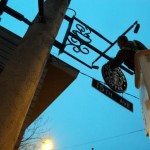 This change will happen on January 31, 2011, with the official introduction of the 15th Avenue Starbucks on February 1, 2011. The experiment that began July 18, 2009, ends Febuary 1, 2011. At 7:00 a.m, this morning (January 24, 2011) I arrived at 15th Avenue Coffee just to check in and say “hi” and to see if any of the transformation was already underway. Lo and behold, the Siren was already hanging up outside. I attempted to take a few photos, but it was still dark outside, and with my weak flash, the photos are still poor quality. All those early morning photos are too dark. I went inside after taking some pictures, and then ordered food, coffee, and chatted with two of my favorite baristas. Lucky for me, they were both there. My timing was really remarkable this morning that I arrived so early. The sun had barely risen (per a Google search, sunrise today was 7:44 a.m.) and a bucket-truck swung by and parked directly in front of the store. I hustled outside to see what was going on. There was a worker in a bucket removing the Siren from the exterior sign. I asked him about it, yelling up to him, and he said something to the effect of ‘the logo had accidentally gone up too early and had to be removed until the 31st.’ Next thing I knew, the logo was gone. I hadn’t been by this store in nearly two weeks, and I happened to catch a worker removing an accidentally installed Siren. What is happening and what does it all mean? I have been trying to figure out with some detail what these changes will really mean. Will the menu look different? What will stay the same? I know the store is getting a “turbo chef” (warming oven) so that it can do warming similar to a typical Starbucks. I am nearly sure that the store will keep their manual machine – which is now a Neuvo Simonelli espresso machine. My understanding is that most of the Essential Bakery items are staying though some changes in food will happen. Since the re-introduced Starbucks at this location will now mimic some elements of Olive Way, it wouldn’t surprise me to see the food slowly become much more closely aligned to the Olive Way food offerings. (Olive Way offers very traditional Starbucks food with only a few variations for “plated” foods that have chips, olives, or other items not sold at a normal Starbucks). There will still be a beer and wine selection. 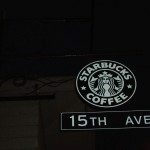 Imitation is the best form of flattery: It appears to me that Starbucks learned a lot from 15th Avenue Coffee and Tea. 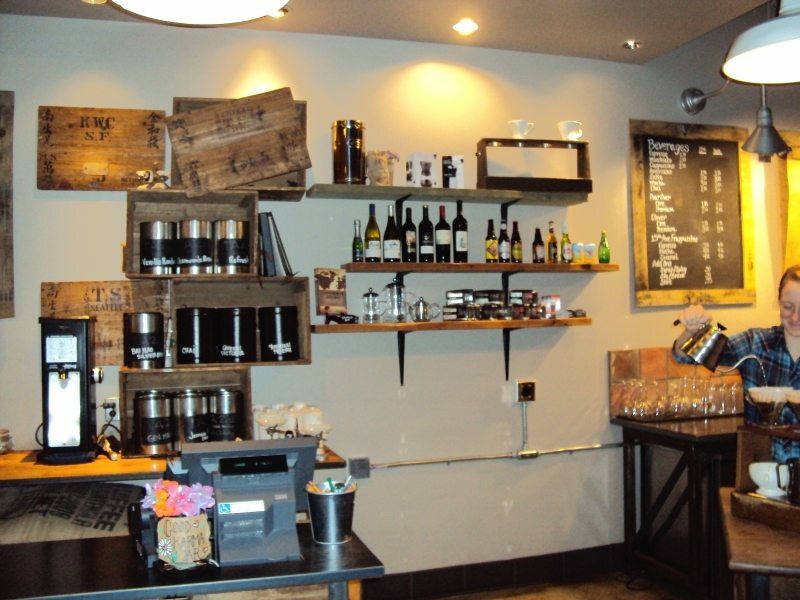 The pour over launched in March 2010 was partly developed from the learning experiences at 15th Avenue Coffee and Tea. Though not widely talked about, Starbucks experimented with cold brew coffee in the summer at 15th Avenue Coffee, as well as the “Pu-erh Fusion Cappuccino” (pu-erh tea, agave nectar, espresso, steamed milk and cocoa powder). Interestingly, the Pu-erh Fusion Cappuccino was never a big seller, and I don’t think I ever got around to trying it, but it was briefly on the menu at some point. 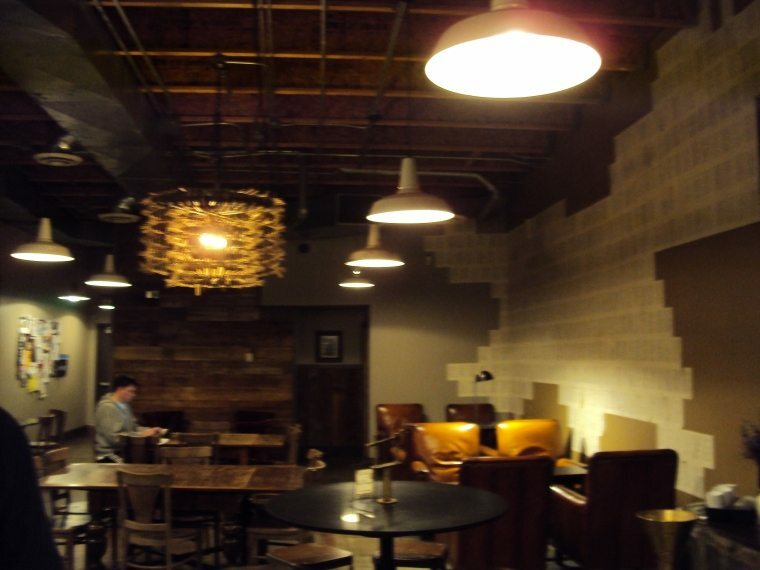 In many ways, Olive Way Starbucks imitated aspects of 15th Avenue Coffee and Tea: Very personable service, relaxed pace, lots of great coffees, beer and wine, and a “repurposed” green store design. Olive Way has been a success: The store is always busy and they’ve given it a very classy Starbucks atmosphere. Partners wear an “elevated” dress code which means a dressier attire, with ties being the norm for men. 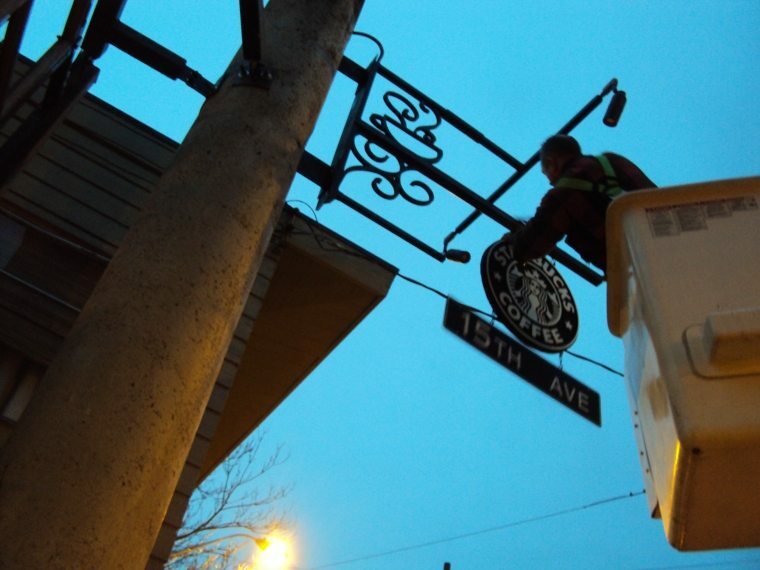 This change of 15th Avenue Coffee and Tea to a Starbucks means that the store has found its long lost sister: Olive Way, and is slightly distancing itself from Roy Street. 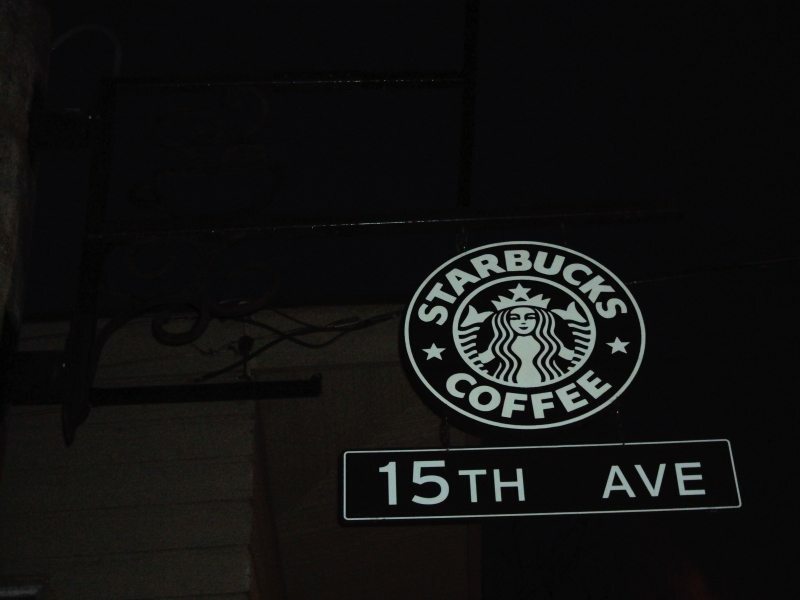 I would note that both Olive Way and 15th Avenue Coffee were Starbucks stores before they were concept stores. They are both smaller than Roy Street, which feels like you’ve walked into a massive theater. 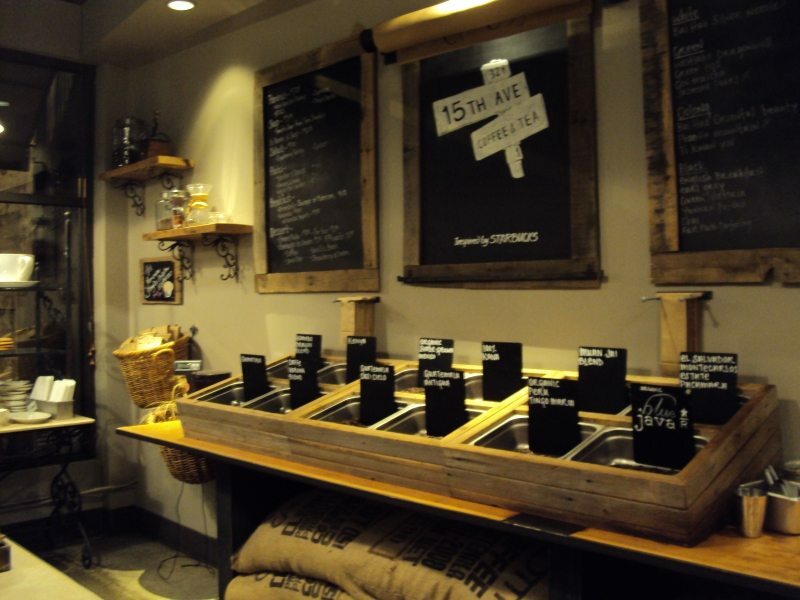 The one thing that I hope does not change at 15th Avenue Coffee and Tea is the coffee passion. I don’t know if there will still be coffee cuppings. The selection of coffee offerings is larger than a normal Starbucks. I started my day today with 100% Kona from the Clover at 15th Avenue Coffee and Tea. And going back to the food selections, I like the unique choices. Who wouldn’t like to start their day with a chocolate peanut butter donut from Mighty O Donuts? Mostly I just wanted to post a few more photos of this store, and share my visit today. This will still be a wonderful store. We all know what makes a Starbucks great: It’s the partners inside. Hope you enjoy! Let's take a trip to Starbucks in Kyoto, Japan, and they have their own card too! Say it ain’t so! I was just talking about this store yesterday! I love your action-shot. Great photojournalism! Your picture of the guy taking down the logo tells an interesting story. Wow! That’s all I can say! I hope they get to keep a lot of what makes them great: the book pinned on the wall. The tastings. 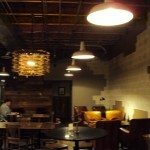 I really enjoyed 15th Ave C&T, and I cannot believe it’s getting re-repurposed. I have a feeling this is in response to something Uncle Howie said about his VIP stores. Sounds like he got bored with this one. Too bad, too! Melody, I’d love for you to talk to Major. This store was his brainchild. See what he knows! Wow, that last image looks amazing. What is that? Just to look at the beans or some kind of tasting station? Would love to have stores like this over here.. I feel sort of sad that the changeover has happened. The uniqueness of this store made it special. Although I totally agree Melody that the partners make a store, I also think the atmoshphere and community of the store are important. Too many of the USA SB stores are cookie cutter stores and don’t have that vibe that is so nice. Bummer. I knew they would eventually they would eventually change it to a Starbucks selling booze. Oy Vay. Ha! too funny (and amazing..all the trouble) about the logo up and down. ironic. I love the inside if this store, especially the last pic of those coffee displays in ‘bins’, kind of. Another great bit of info…. and pics. @Danise – I know! It is hilarious that the accidentally put the sign up early, and really funny my timing to the store! 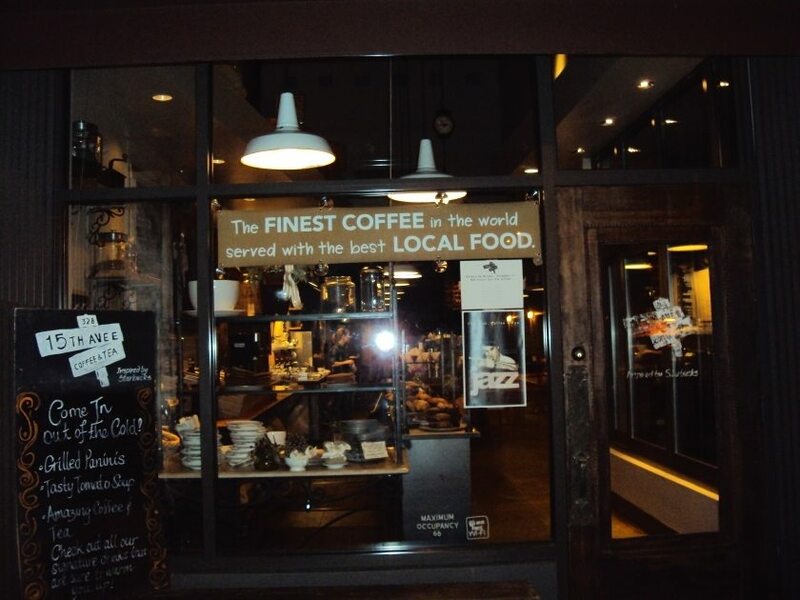 @MarkDavid – Whole bean in this store comes from the Kent Roasting Plant fast than the regular distribution methods. It’s definitely a little fresher. 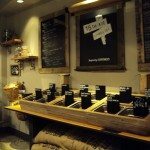 I’ve had coffee roasted within just one week of its actual roasting when buying from this store. It is “scooped” from the bins and weighed out for the customer. I really hope the store does get to keep the manual espresso machine, if only because I’d like all lower volume Starbucks locations to use them. Thank you for documenting 15th Avenue’s truly great run. It’s nice to see that the company has learned things from this experiment and are applying them elsewhere. A short but impactful life. Do you think the sign will be replaced with the new logo? i love the action shot! Great action shot, Melody! How funny that the siren went up and down! I’m so bummed I’m traveling halfway round the world only to miss out on seeing 15th Ave by a matter of days! On the flip side, I’ll get to see the new store in its infancy. I really hope they keep the cuppings – they’ve become somewhat legendary! Honestly, I welcome this change. At 15th Ave, I never warmed up to pour-over drip coffee; coffee from the regular urns tastes fuller and more consistent from cup to cup. The absence of the traditional iced coffee was another thorn for me. There was also the lack of labels/placards on the baked goods, so it was hard to tell what each item was. I hope they keep the interior mostly the same, though, because it’s an asset for sure. 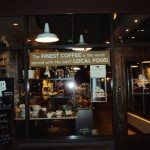 Melody … I remember when 15th Ave. Coffee & Tea was unveiled many people positioned it as a growth vehicle for Starbucks. I thought differently. As we talked about it when we met there last June, this location always felt like a petri dish experiment so that the company could learn (and in many cases, re-learn). It will be interesting to see what stays on the menu and what doesn’t. I’m excited at reporting new signboard is set up 15th. Also I like your sentence. “Goodbye 15th Avenue Coffee and Tea. Welcome home Starbucks Coffee”. Melody, do you remember that day? We met at 1912 Pike Place in the morning of this 11st, the day when I met Winter Starbucks visit hero at Olive Way. 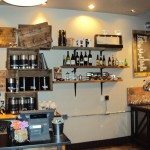 I visited the Roy street coffee & tea before going to an Olive Way and was able to ask Major a question. “May I ask you a question? I watched that news. When does 15th become Starbucks?”. “It seem to be the Olive Way?”. “15th increases these. The Starbucks logo, system of Starbucks, Starbucks merchandise. But I do not change the thing which 15th offers originally. For example, foods”. 15th continued various tests to give Starbucks a change of the new age. I think the achievement of 15th is so great. 15th which completed enough tests is back to Starbucks, but the original offer as 15th will not change. This is my opinion. I’m surprised at the signboard. Because it’s not the new logo. I thought that 15th was a store with the logo of a new design first. Why is not it a new design? Like Starbucks of the Tacoma mall, will 15th continue an old design? Photo : 1912 Pike Place in the morning this 11st. @Nob – It would have been appropriate for the 15th Avenue store to get the newest logo, but since the 40th Anniversary is not until March, I don’t think we will see the logo popping up places until March. That really was absolutely hilarious the day we ran into each early morning at 1912 Pike Place! What a great start to the morning. @amazonv @jorda_nn @deniser – Agree that it is such a riot to see the logo go up and then down, and soon up again! That pic with the man in the bucket taking the sign down, nearly tells the whole story! @MarkDavid This store has scooped beans that are distributed quickly to the store from the Kent Roasting Plant. They tend to be fresher than what is in a typical Starbucks. @Brendan206 – I never really thought about the lack of placards on the pastry items until you just now mentioned it! I think Roy Street has a better design for pastries, and theirs do have the labels. I suspect they will keep the Pour Over system, and I really don’t know if they are adding a brewing system with urns like a traditional Starbucks. All I know is that what ever it is, I’ll be a little disappointed if they start brewing Pike Place Roast, all day, every day! Aww…sad! I looove those bins! @Hayley – I hope the bins stay too! I’m also worried that this store will stop getting its exotic selection of coffees. The store often offers really great rare international only Starbucks coffees! @Skooter – That is a really nice thing to say. It’s true I get a little giddy at times. I realize that I have poured myself into Starbucks in an incredibly complete way. It’s an extreme mental break from dealing with stressful work. I really appreciate your nice thoughts and props on my writing. It’s funny but I’ve been toying with the idea of writing a book because my Starbucks experiences from 2008 to present have been an incredible journey. I just don’t know how to write a book! Enjoy your shirt, and yes, it just went up in value! hahaha. I bought some dish-wear from 15th Avenue Coffee as memorabelia (sp?) and if I ever have a Starbucks museum, it’ll will go in my collection. Hopefully it will retain it’s adult beverages. I’m so looking forward to coming to Seattle to try all the test stores. I’m also surprised that they didn’t hang the new logo, seems like it would make sense to rebrand it with the new rebranding, but I guess it doesn’t officially launch until March right? BTW, Blue Java—freaking awesome! Jenni and I couldn’t even describe it, but when I read that you called it “fresh” you were totally right, that is the only word that even comes close! This is the first post I’ve left on Melody’s site–it is not often I reach out to blogs and comment, but I’m writing because this is significant to me. When I heard about the opening of 15th Ave in the press, I was a bit skeptical. “Here goes Starbucks stirring things up again; they have to fake who they are to compete.” After a few months, I did finally make it in one night looking for a place to study, and I was blown away at the atmosphere and what had been done. I realized that, no, this wasn’t a falsehood–they were using resources and making decisions to keep their stores adaptable to local settings like Capitol Hill. This was not selling out–it was brilliant. To this day I like the idea of Starbucks being able to run multiple shops and adjusting them as necessary to the surrounding demographics and cultures. Everyone knows it’s owned by them (the logo is still displayed small on the front door), but what’s wrong with having something a little different? Finally the customers get to decide not only which Starbucks they enter but which kind. The artwork at 15th, the larger variety of coffees, down-to-earth employees, less “standardized” procedures, and the live music–these are things that cannot be traded, and it would be a shame to see a return to a Starbucks store compromise any of them. I hope to make it back in once more before the “conversion” happens and thank everyone there for being awesome. Without a doubt this store was a huge success, so much so that I think nothing needs to be done. I didn’t see 15th Ave as a “test,” but as a staple shop in Capitol Hill. I hope to see things like this have a lasting place in the Starbucks business model. 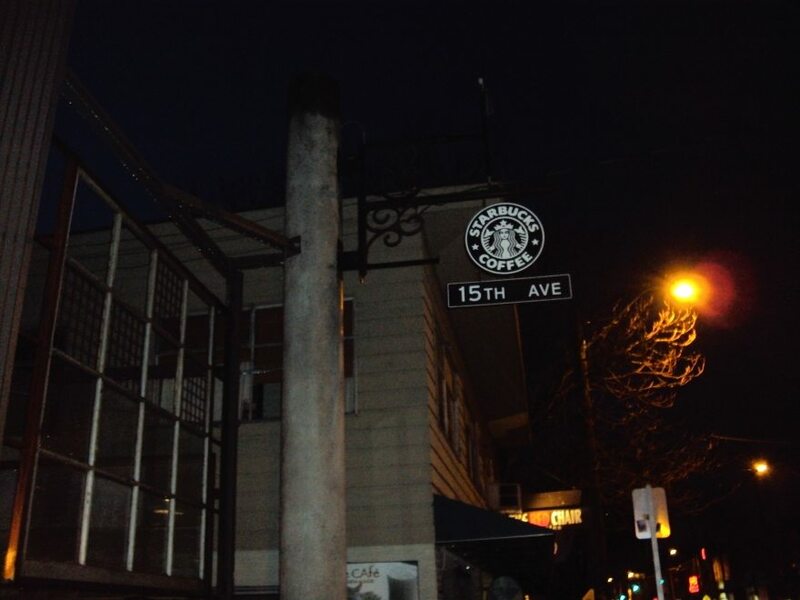 Mark … if 15th Ave. Coffee & Tea was indeed a huge success then Starbucks wouldn’t be rebranding/repositioning it from being a test kitchen to being a Starbucks. It could have been a success in making an impact in the Capitol Hill community but if it didn’t achieve financial success, then Starbucks wouldn’t change it. 15th Ave. Coffee & Tea has a great feel but my experience tells me it was an expensive place to run and thus, it needed lots of customers buying lots of stuff to be profitable. Had there been lots of customers buying lots of stuff, Starbucks wouldn’t be keeping it and rebranding/repositioning it. Dig?